The 2018 NBA season is almost upon us and that means it’s once again time for you to try and convince the world that you need NBA League Pass, even if there is no way to justify it being worth $250. But you will do it, NBA fan, or at least attempt to talk someone into thinking you should do it, so that you can then do it and be the proud NBA fan you are without (as much) guilt. And if you do want to sign-up, you can now do so through YouTube TV. After dropping details on the service back in August, YouTube TV just fired up the subscription options for NBA League Pass. If you don’t have $249 to throw down upfront for the entire season, you can opt for the monthly subscription, which runs $40/mo and lets you cancel at any time. Whichever option you choose, you’ll be billed through your YouTube TV account. For those new, NBA League Pass gives you ad-free viewing of out-of-market games where you can often choose to listen to either home or away broadcasters, plus you get on-demand playback of games. Also, YouTube TV should show upcoming games in your Home and Live tabs one hour before they start. That’s pretty cool. 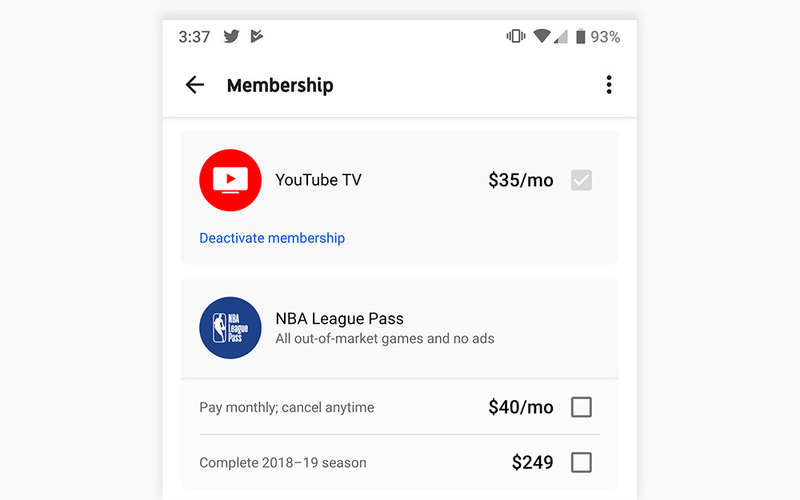 To sign-up, open YouTube TV and head into Settings>Membership. You should see both options in there.